...Even if I have the XVIII black which I positively love more than any watch I've ever owned? Seriously, I've had it for nearly 6 months and it still feels like I'm in the honeymoon phase. BUT I still love the Bremont. 1) Yes, I have the MBII for sale currently but (full disclosure) the ratchet wheel teeth broke after I posted the sales thread and it's being repaired by Timeless Luxury's watchmaker under their pre-owned warranty. I haven't bumped the thread since. That being said it's not a full service candidate (if I want the work done for free) which I've verified with another reputable maker, but Bremont parts are being used so that's good. 2) I have two custom straps in the works for the MBII that were commissioned after me posting the sales thread! Crazy I know, but don't act like this hasn't happened with some of you before... I'd be willing to bet a number of people here have sold a watch before their name was called for a custom strap destined for a watch they no longer own. I still have time in the queue so both can be switched to a strap suitable for the IWC. 3) I'm taking a bath on the Bremont which is to be expected. I think my price is good for the full kit and really don't want go lower than the price I have posted here (I won't deal outside of DWC any lower), but is the Silver/White XVIII worth ~$700 more if I do find a buyer? Re: Sell MBII for Mk. XVIII Silver/White...? I'd keep the IWC you love and keep the Bremont. I don't think I'd buy the white Mk. XVIII if I already had the black dial - too similar. If you love the white dial then how about selling the XVIII and buying a black Mk. XV and a white XVIII? I think the XV and XVIII are different enough and you'd have the start of a nice Mark collection. I'd suggest a white XV but they are like hen's teeth. All of this is said from the perspective of a non-Bremont guy so take it with a grain of salt. Funny you mention this because I've considered adding the black Mk XV. No way I'll risk letting the black xviii go. 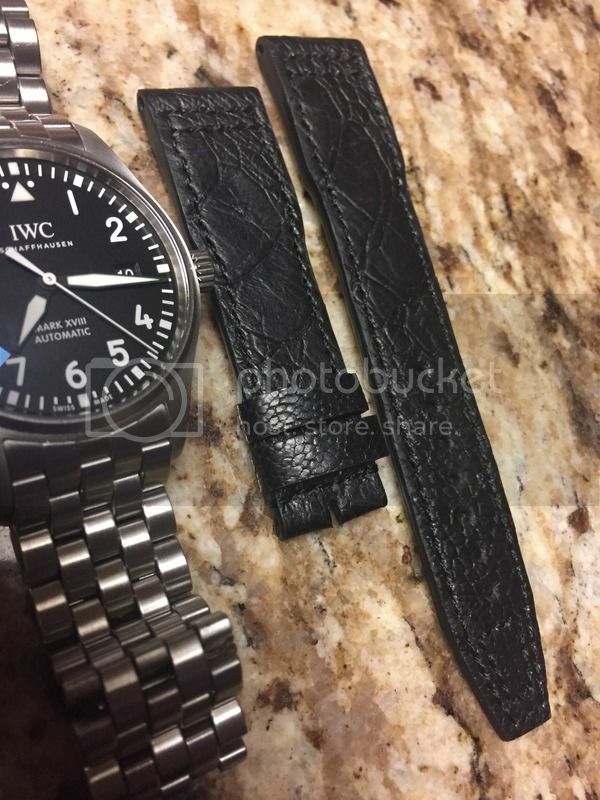 Clearly you've been bitten by the IWC mark bug too. It's such a classic piece that gets so much right (with the exception of the XVII IMHO). Prices are still right with the XV black and it's every bit as much a watch as the 14060 at less-than early 14060 prices... With the XVIII on bracelet it's like 14060 with glidelock at half the price. The fact that IWC sells it as an "entry level IWC" is fine by me because it's a bargain when compared to the competition. Had my MBII sold I would have been in a position to buy the very same watch you picked-up, but I'm glad it didn't work out because whomever picked up my MBII would have been faced with a potentially broken watch. A blessing in disguise. White XV would be a no-brainer but they're just too much now unless you have an in with someone looking to move one at <$3600 (a seller on chrono24 is asking stupid money currently), plus the XVIII white gets so much right at ~$3100 it's a easier decision, especially when I can swap the bracelet and have a bit of fun with both on the custom strap commissions. 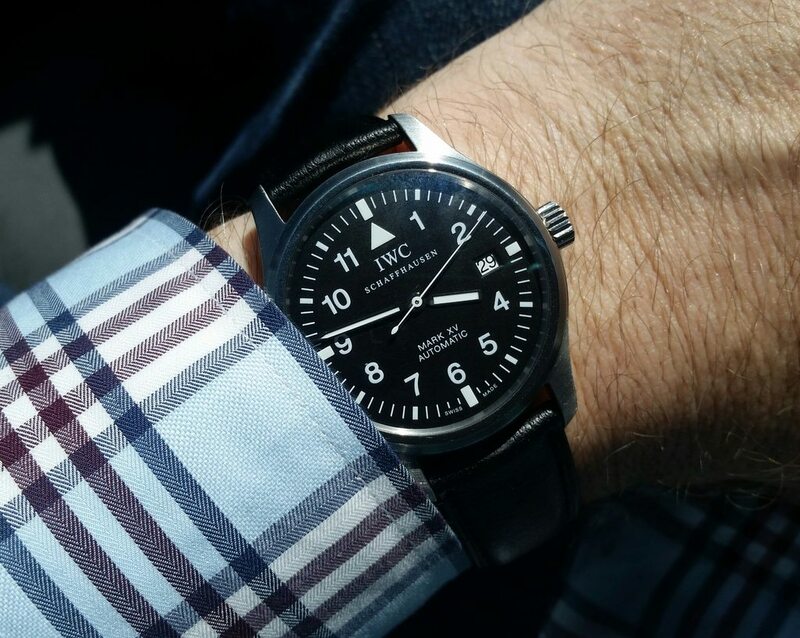 The slightly off-center date is a non-issue when you handle one and the fact it's the same IWC cal. 30110 which everyone assumed was the Sellita helps it maintain the prestige a bit. Clearly you've been bitten by the IWC mark bug too. Now you've got me thinking about a Mark XVIII, despite the date placement. Maybe the white/silver dial would be a good complement to the XV? Or maybe a black XVI?! Date placement is a non issue once you try it. Oh dear... Seems Jeanna from Stone Creek might make my decision a bit easier. How else am I supposed to get an IWC buckle? Damn this strap is nice! Pics make it look a bit strange (ostrich leg) but it's lovely. Congrats. The white XVIII is cool.